Contact the Delaware Canal State Park office for facility seasons and hours. 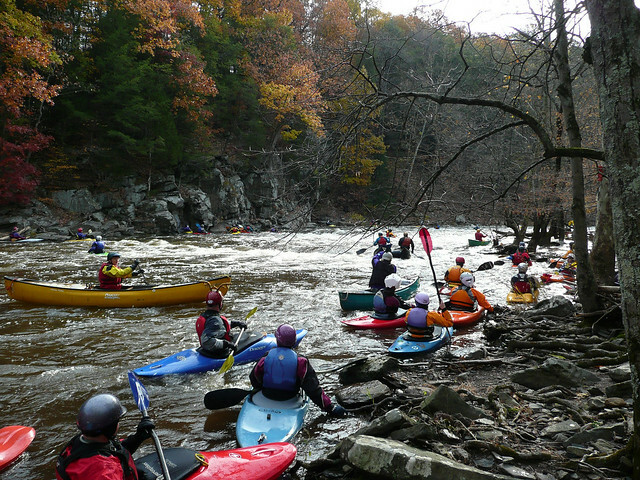 Ralph Stover State Park is two miles north of Point Pleasant on State Park Road and Stump Road, in eastern Bucks County. Driving Directions: The Interactive GIS Map has turn-by-turn driving directions to the park from the Park Information Window. The High Rocks section of the park features an outstanding view of a horseshoe bend in Tohickon Creek Gorge and the surrounding forest. Experienced rock climbers use the 150-foot, sheer rock face, but the cliffs are dangerous. Visitors must stay behind the safety rail. Ralph Stover State Park participates in a carry-in/carry-out trash disposal program for small parks. There are no trash collection or recycling facilities. Visitors are asked to limit the amount of disposable items brought to the park and to take all trash, garbage, and recyclables home with them. The park offers a wide variety of environmental education and interpretive programs year-round. Through hands-on activities, guided walks, and evening programs, participants gain appreciation, understanding, and develop a sense of stewardship toward natural and cultural resources.